There are hundreds more stats that back up how powerful email marketing can be, but the point is that this channel is the best way to reach your audience. Email has played an important role in the growth of Setapp. In this post, I’ll take you through how to set up your own email campaigns, with examples of how we’ve done things. Let’s get into it. It’s essential to have clearly established goals. And that these goals align with your company’s wider marketing strategy. Your goal could be to raise awareness and build the brand, generate more leads, upsell or cross-sell products, gain feedback, increase click-throughs, or just to engage more with your audience. For us, the goal is to increase the number of paying subscribers. 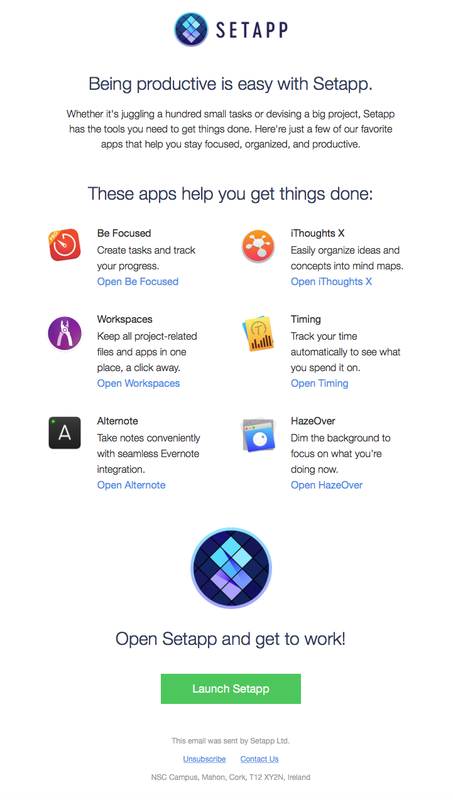 Setapp is the first subscription service for Mac apps with a growing collection of tools for any job. Through email, we’re able to let users know about the variety of apps available on the platform and how they can help users in solving their everyday tasks. We also include app tips and tricks and inform users about newly added apps to keep them engaged with the service. By deciding on what you want to gain from email marketing from the outset, you’ll be able to tailor campaigns for better results. Email marketing tools make life a lot easier when it comes to creating and sending mass emails, building lists, and measuring results. There’s no shortage of tools on the market, but finding the right one for you is by no means a straightforward task. To narrow down the choice, start by making a list of features that you require. Tools for A/B testing, user segmentation, email automation, in-depth analytics, and a newsletter editor are all must-haves and should be included in any service you decide on. But other things might also be important to you, like app and customer relationship management system integration, ready to use templates, auto-responders, and, of course, cost. Review the pricing plans — are there plans that can scale with your business? The most important thing here is make it easy for users to sign-up. A newsletter sign-up form on your website is the best place to start. You can place email subscription forms in the header, footer, or sidebar of your website. Test pop-ups too. They’re not always successful, but depending on what you’re offering subscribers, a pop-up can really boost numbers. If you have an app, make opt-in available there. Also, harness the power of social media by creating Twitter cards, or a Facebook call to action button that users can click to sign-up. When building a list, it’s important to remember (and accept) that not everyone who subscribes will stick around. You will have people that unsubscribe. Prepare an unsubscribe page that lets users know that you’re sorry they’re leaving. And be creative with it. Here's how the Setapp unsubscribe page looks like. Every 26th person clicks on a resubscribe button. First impressions count for a lot. A good one can turn a subscriber into a paying customer, whereas a bad one can damage company reputation. Automated welcome emails have an average open rate of 32% — higher than promotional campaigns. Use this opportunity to send a warm greeting (preferably personalized), provide an overview of what the subscriber can expect, and include something immediately useful. As your list grows, reusable email templates will help to save time and prevent design inconsistencies. Templates should be created for all main email types: welcome emails, user onboarding, special offers, re-engagement, transactional, etc. When crafting a template, it’s best to keep things simple; this makes it easier to import new content when needed. Notice that the design is clean, with plenty of white space and a clear call-to-action. Templates shouldn’t overwhelm a user. Make them easy to read and navigate, and always include a visible unsubscribe link. Email list segmentation ensures the correct emails are sent to the right person at the most optimal time. Lists can be segmented based on any number of metrics: location, age, gender, language, browser or device used, interests, social status, or purchase history. The more information you have, the easier it is to segment and tailor campaigns for maximum ROI. Below I've listed a few of the ways we’ve successfully segmented email subscribers. That’s my favourite part actually. Automated email journeys are initiated by user behavior and allow you to send targeted, promotional content that is relevant to an individual recipient. During the previous year, we’ve made over 10 iterations of an email journey for our tial users. We keep learning from it and making changes. Over the past year, we’ve created over 10 iterations of an email journey for Setapp trial users, each time taking the results of a campaign and making changes for better performance. For those who don’t engage with the service, automated re-engagement emails are sent to entice them into interacting with Setapp. Testing is a key to success, as it can bring some dramatic changes into your results. So try to A/B test as much as you can to tailor campaigns for better performance. Results, like testing, are essential for improved performance. You must track results to learn more about subscribers and how they interact with your emails. Results can be tracked via email marketing software reporting and analytic features, and your website analytics tool, i.e. Google Analytics. There are currently over 6.32 billion email accounts in the world. That number will rise to 7.71 billion by 2021. 3.7 billion people use email every day. Email is where your audience is, and now you know how to reach them.